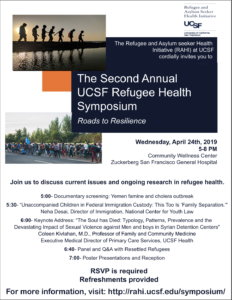 Please join us for the Second Annual UCSF Refugee Health Symposium on April 24 at 5PM at Zuckerberg San Francisco General Hospital, hosted by the Refugee and Asylum seeker Health Initiative (RAHI) at UCSF. The UCSF Refugee Health Symposium is a one-of-a-kind, multidisciplinary annual event that brings together refugee health experts in the fields of medicine, law, mental health, public health, and community organizations, in addition to students, trainees, volunteers, and interested members of the public from all over the Bay Area. The Symposium provides an annual opportunity to discuss current issues and ongoing research in refugee health. Each year, the Symposium focuses on major current themes in forced displacement. Key topics this year include the Yemen famine and cholera outbreak, family separation of asylum seekers at the U.S. border, and torture survivors from the Syrian civil war. We will also learn from a panel of resettled refugees, and discuss the current state of refugee health at UCSF. Afterward, please join us for a reception and review of recent refugee health research during our new poster presentation session. Our keynote speakers this year are Dr. Coleen Kivlahan, Professor of Family and Community Medicine at UCSF and Executive Medical Director of Primary Care Services at UCSF Health; and Neha Desai, Attorney and Director of Immigration at the National Center for Youth Law. This event is free and open to the public, but due to the limited capacity of the Community Wellness Center, RSVP is required for entry.